The Garrett family has a long lineage of players who have made it to the professional level. Father Jim, and brothers Jason and John have all played or coached in the NFL or WLAF. 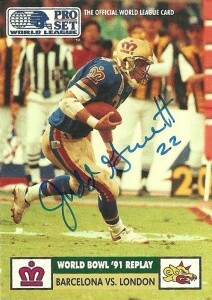 Judd Garrett was drafted in the 12th round of the 1990 NFL draft by the Philadelphia Eagles. He’d be released, but quickly placed on Dallas’ IR list. 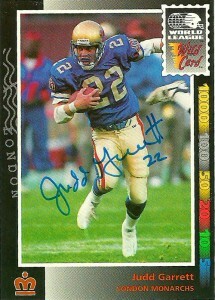 The WLAF London Monarchs would draft Judd to play runningback for the team in 1991. While Garrett would spend very little of his time rushing the ball, he’d be an exceptional receiver out of the backfield, making a league high 71 receptions in 1991. In World Bowl I, he’d set a World League record with 13 receptions during the game. 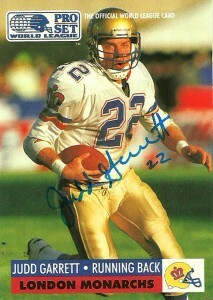 He’d return to the Monarchs in 1992, and while the team sunk, Judd would still amass 55 more receptions, finishing his brief career as the WLAF’s leading receiver with 126 catches. 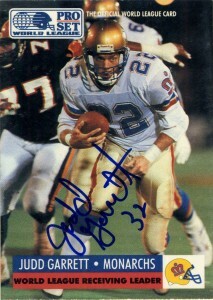 He’s also notable as being the first points scored in the WLAF as he was stuffed in the endzone by the Frankfurt Galaxy for a safety. 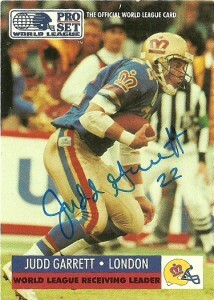 After playing for the WLAF he’d sign with the Cowboys again. I’d get his autograph at camp but he’d not make the squad. 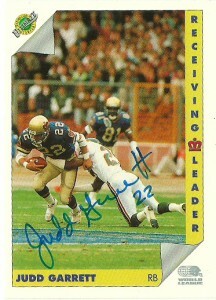 Garrett would play in the CFL for two seasons after that with the Las Vegas Posse (1994) and the San Antonio Texans (1995) before his playing career ended. Judd went into coaching where he’s served with the Saints (1997-1999), Dolphins (2000-2005), Rams (2006-2007) and is currently serving in the front office of the Cowboys along with his brothers Jason and John. I attempted to get the autographs of all 3 earlier this year, but met with no success. I sent again just to Judd in early August and was happy to get a seven day turn around plus a very nice thank-you letter for being a fan and for following him and the league.